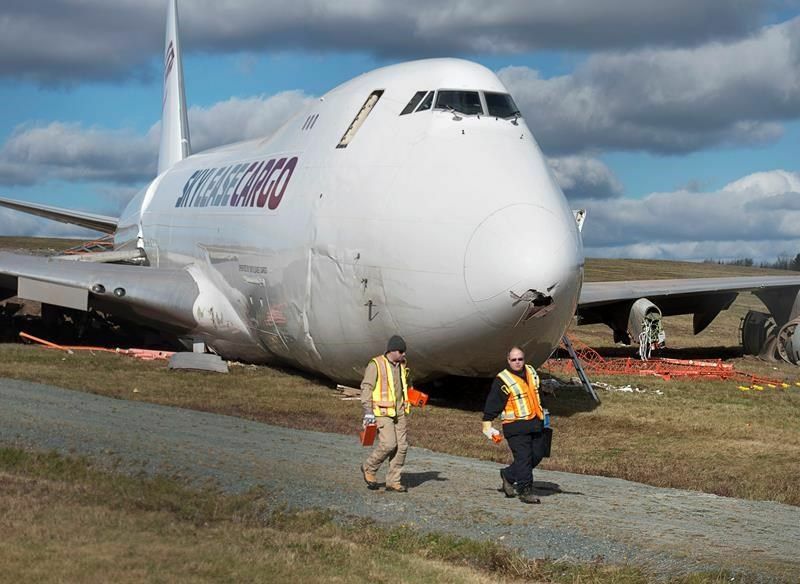 A Boeing 747-400 was landing on a wet runway in a brisk quartering tailwind when it was destroyed in a runway excursion at Halifax-Stanfield International Airport on Thursday. Four crew members on the Skylease Cargo plane suffered minor injuries in the accident, which occurred about 5 a.m. Transportation Safety Board investigator Austin Adams said the aircraft landed on Runway 14 with winds reported at 33 kmh at 250 degrees. It ended up 210 metres from the runway near the airport perimeter fence. Along the way, the it took out a localizer, lost its gear and two engines and one of the loose engines lodged under the tail and caught fire. The flight originated in Chicago and the 747 was due to be loaded with live lobster for a flight to China.